And we're back! After a short hiatus, our Developer Blog has returned to bring you inside the development of Gears of War 4 direct from The Coalition. While we've been away, the flow of Gears of War 4 news has kept coming via IGN First including brand new gameplay and the reveal of some new enemies - The DeeBees. We know you're craving more - the good news is that there's plenty more IGN First content to come throughout August. Be sure to bookmark their Gears of War 4 hub to catch all the latest coverage. Amongst all the reaction to the IGN First coverage, we noticed some eagle eyed viewers among you pointed out the new Roadie Run animation that was on show in some of the MP gameplay. Nicely spotted! But this also got us thinking - animation is one of the most noticable elements of any video game today, but also one of the least talked about. So let's shine a spotlight on it, shall we? To bring you into the world of animation and show off some of our new animations from the game, I sat down with Jason Hopkins (Lead Animator) to talk about bringing the characters and creatures of Gears of War 4 to life. Welcome to Developer Blog 4: The Art of Animation. The Swarm team's 'race' execution in Versus Multiplayer. Tapping Y extends the execution. Octus: Modern day games are a blend of Mo-Cap and hand animation. How do you use the two together to build animations? Jason: We worked hard to nail the performances at the mocap shoot in order to utilize as much of that data in the game. We wanted to avoid having to edit the motion capture too much and risk losing some of the magic we captured. As an example of that, we actually hired stunt guys with training to perform the CCC shanks for us which was pretty awesome! The shanks probably needed the most editing though. Even though the actors did a great job at mimicking the shanks, the impact and timing wasn’t quite where we needed them to be to feel super visceral – to achieve that, we accelerated sections of the mocap, slowed other moments down and cleaned the posing to make it clear what was happening for each execution. We also used the same cinematic actor or actress for each character to capture the character’s movement in order to keep a consistent feel to our characters across cinematics and gameplay. We do a lot of clean-up on the mocap after the fact, but my goal was to try and keep the essence of the original as close as possible. One of the things we’re really happy about for Gears 4 is the opportunity to create unique animations for females and males in the game. If you play the campaign with Kait for example, you’ll see that she has her own unique animation set. I wanted to make sure she felt like her own character so she didn’t walk around with the same male set. There’s quite a few subtle changes we’ve made to the overall player movement as well. One of the best comparisons from Gears 3 to Gears 4 is our new pistol move-set which we started over from scratch on. I felt like it was pretty clunky in Gears 3 and so we mocapped that all and gave it an overhaul. Our goal for approaching the core animation for this game was “Make it feel and look like you remember it feeling and looking.” It’s a rose-tinted glasses type thing. The whole project has been a fine balance, because anything we did to try and improve the core animation could have effects on the Multiplayer experience. We didn’t put anything in the game without making sure the MP team was aware of it so they could test and evaluate the changes to make sure it didn’t hurt that experience. Octus: Gears of War 4 has a diverse range of enemies – from DeeBees to Swarm in a variety of shapes and sizes. How does your team’s approach change from enemy to enemy? Jason: The thing I love most about Gears as an animator are the creatures and enemies. They can be so outlandish and awesome, it’s easy to get the creativity flowing once you see a great concept piece or prototype. As an animator, I love being involved in this early process so we can help provide some ideas and concept-animations - or even just listen in on the decisions and thoughts behind the design. Bringing a new enemy to life is really collaborative and iterative (it has to be!). Once they’re in production, they kind of take on a life of their own and you have to sometimes adjust to what they become. Each creature or character has his own unique set of challenges. Some creatures require a ton of iteration before settling on what we could do and how we could actually complete it (there’s a creature I still have nightmares about!). With other creatures, we knew exactly what we wanted to do, but it took a lot of iteration to get it moving and behaving the way we wanted (I’m looking at you Juvie). All in all, each creature presents totally different sets of challenges. It’s our job as animators, engineers and tech animators to bridge the gap between concept and design, and try to make something memorable and most importantly fun for the player to fight! Octus: So let’s take the Pouncer for example, which is vastly different from any enemy seen before in Gears. How did you bring it to life through animation? Jason: The Pouncer was the first enemy we made and so it has a special place in my heart. It was early enough in the project that we were able to concept quite a bit of animation - the Pouncers shape changed quite a lot in the first few weeks of its conceptualization until we landed on what you'll see in the game this October. One of the big improvements that was made during the creation of this guy was the jump arc that he takes. Our smarty pants Lead Animation Engineer (don’t tell him I told you he’s smart, it’ll go right to his head) came up with a way to ensure each of the jumps he chooses has a really nice trajectory that works in concert with our other animations. It made a big impact on how the Pouncer looks while he’s jumping around. The thing I love about the Pouncer is how much interaction you can do with it. You can get him down to low health and chainsaw him out of the air, you can run over to your team-mate and kick him off, you can get pounced on, you can get your head ripped off by him - as a creature, he was super fun to make! A lot of those ideas came from design and some of them came from “wouldn’t it be cool if?” conversations we had. They really wanted to make a fun co-op enemy and I think he turned out pretty cool. Time it right, and you can chainsaw a weakened Pouncer in mid-air! Octus: What animations are you most excited for fans to see in Gears of War 4 if you had to pick just a few? Jason: That’s a tough one, there’s some pretty cool ones – gonna say more than a few (sorry!). There’s a cool little animation we added where if you get shot and fall into DBNO, you now do a little roll into DBNO depending on the direction you were hit from. There’s also a death animation from DBNO now too if you get shot while down. The Swarm Drones have gotten an upgrade from the Locust in terms of maneuverability. They do nicer mantles and movement around cover and their hit-reactions got an upgrade too. Something we’re excited to show today in this Blog is the new Swarm team 'race' execution in Versus Multiplayer. If the COG get one, so should the Swarm! We put a ton of animation work into our character’s reactions to the Wind. Depending on the direction you’re standing, your pose will change and you’ll even lean into the wind. All of the Swarm Drones have reactions in wind, for example, when you shoot them while they are in cover or destroy their cover. There’s also a little wind layer that gets added too so the character is constantly adjusting as though they’re flinching from debris. My personal favorite is the more fluid Vault - it feels pretty great (especially when that nice vault leads into someone stumbling back and eating my shotgun or knife). I also really like the subtle hop-up you can do with the Vault - instead of having to hit cover before you can mantle up an object, you can now do a little hop-up that gets you there faster. Yanking someone over cover is a hard maneuver to pull off in Versus Multiplayer, but it feels SO good when you do it. It’s funny I remember when the idea of pulling someone over cover came up in a meeting - in my head I was thinking “how the heck are we going to do that?!’. Some of our cover is pretty wide, so you’d almost have to dive right on top of the object with your whole body and drag the other person back. I thought that would look incredibly weird. Then Jerry, one of the lead engineers, did just that - he jumped sprawling right across the table in the meeting grabbing someone across the table and that was it. After that, I dubbed it the “The Jerry Jump”! The new 'Roll to Down' animation, which occurs when being downed during a roll. Overall, it’s been a lot of hard work from Engineering, Technical Animators and the awesome Animators on our team. We all worked hard together to create creatures, player animations and experiences that we feel make a true Gears of War game. I can’t wait for people to play it! 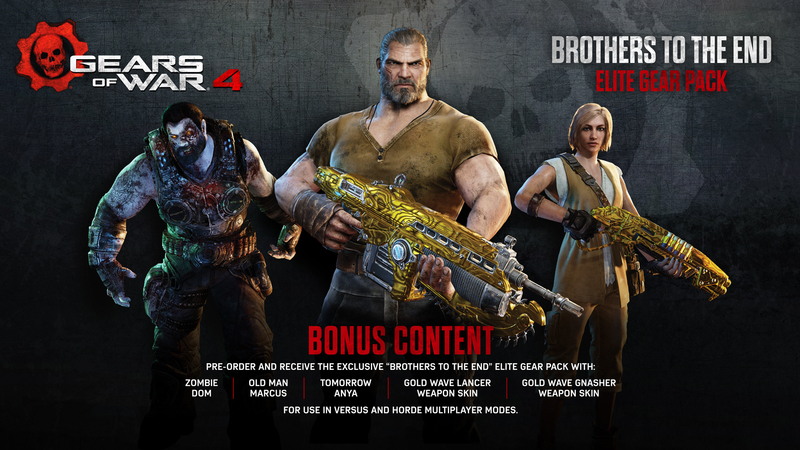 We recently announced a brand new pre-order bonus included with Gears of War 4 called 'The Brothers To The End Elite Gear Pack'. This pack is filled with some extra special characters from the Gears of War universe, and also harkens back to Gears heritage with some sweet Gold Weapon skins to show you were there day one. “Tomorrow Anya” Character - Named after her famous words following the end of the Locust War (“Tomorrow Marcus. We finally have a tomorrow.”) Her appearance is based on her look in the Gears of War 4 television commercial, “Tomorrow,” where she was introduced as the mother of JD Fenix. Since we know there's been some questions, this pack is included in every edition of Gears of War 4, including the custom Gears of War 4 Limited Edition Xbox One S and our Gears of War 4 Lootcrate. All new and current pre-order customers will also receive the Vintage Del Pack, which includes the Vintage Del character model and retailer-specific bonus items, including unique weapon skins. We hope to see you online rocking your character of choice come Launch Day! That's it for this week's Development Blog - we'll be back very soon with another drop of Gears of War 4 info. See you then.